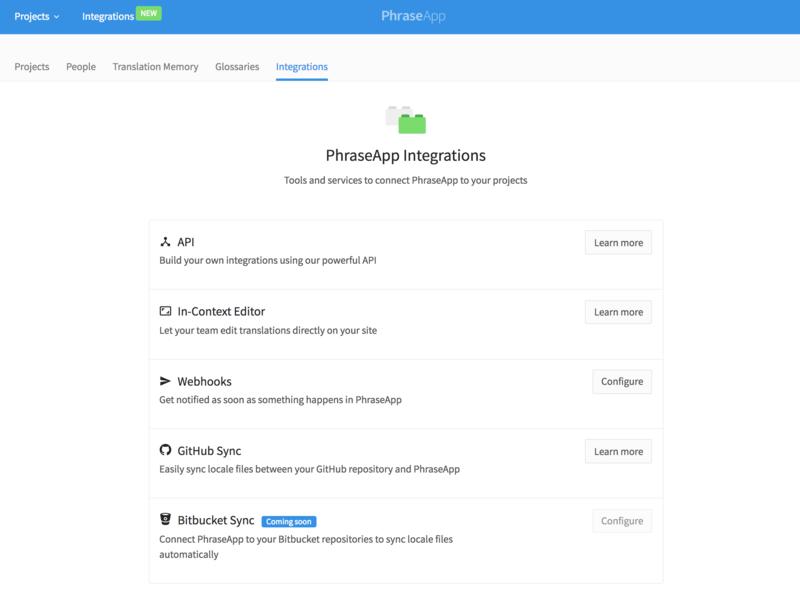 A mechanism to notify external services like chat clients or other external APIs of events that happened in PhraseApp via webhooks. A webhook is a mechanism to notify external services like chat clients, project management tools or other external APIs of events or changes that happened in PhraseApp.This feature allows you to register a callback URL that will receive a call whenever a certain event takes place in PhraseApp. You can test your webhooks in order to verify that the endpoint is receiving the event notification. Just click the “Send test notification”-link. This will send an example event notification to the provided callback URL. An easy way to capture the contents of a webhook is to use a service like RequestBin. It gives you a URL that will collect requests made to it so that you can easily inspect their content. Once you register a webhook, we will send a POST request to the specified callback URL every time an event of the specified type occurs. The request’s POST payload is a JSON-encoded document with relevant data for the event. The attributes event and message will always be included with additional relevant resources like the user and project. Ty of event that triggered this hook. HMAC hex digest of the payload, using the hook's secret as they key. Your webhook endpoint is required to return a HTTP status in the 2xx range within 5 seconds upon receiving a callback. Any other HTTP status code or a request timeout is considered to be a delivery failure. A webhook will be deactivated if delivery fails for more than 10 consecutive events. Callbacks are not repeated. If you’re receiving a callback, the most important thing to do is respond within the 5 second request-timeout-period. To make sure that apps do not accidentally trigger a timeout, we recommend that apps defer processing to a time after the http response has been sent. Each webhook request includes a X-PhraseApp-Signature header which is generated using your app’s shared secret, along with the data sent in the request. You can verify that the request originated from PhraseApp by computing the HMAC digest of the request body and comparing it to the value in the X-PhraseApp-Signature header. Slack is a platform for team communication: everything in one place, instantly searchable, available wherever you go. Slack enables integrations that let you automatically pull information and activity from outside tools into Slack in a way that’s timely, relevant and searchable. Go to ‘Add Incoming Webhook’ in your slack account. Select the desired channel to post to. 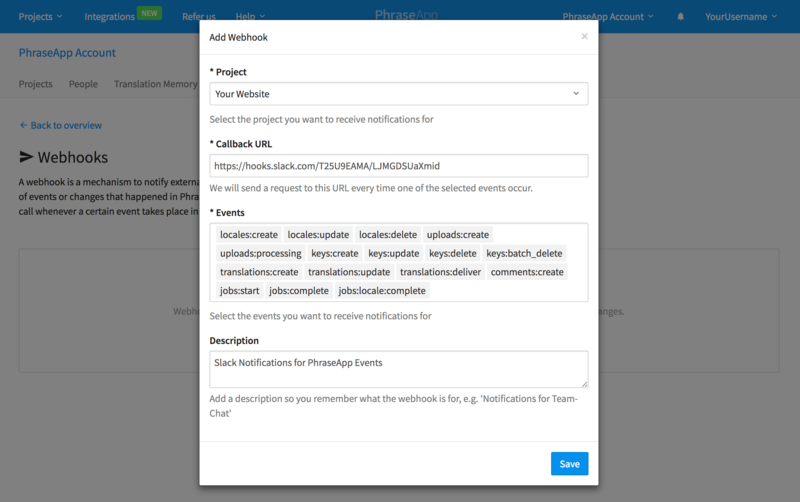 Once created, copy the provided Webhook URL and follow the steps describe above to create a webhook within PhraseApp using the Webhook URL as Callback-URL. We will send a POST request to the provided URL every time an event of the specified type occurs. The request’s POST payload is a JSON-encoded document with relevant data required by Slack to display a short description of the occurred event in a dedicated channel. You can deactivate an existing webhook by clicking “Deactivate Webhook” under “More”, without the need of deleting it completely.